Entertain your little dog lovers with Lord Banjo’s coloring book. They’ll smile while they color the pics of this lovable, huggable dog. Bonus: When the little ones have colored all the pics in Coloring with Lord Banjo, contact the author for additional pages to print at home. Want to know how this adorable family dog became a Royal Pooch? 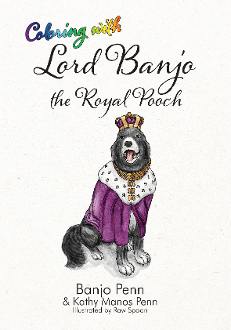 Pet parents and dog lovers ages 9+ are already enjoying his story in Lord Banjo the Royal Pooch. Order your copy today, read it aloud to younger dog lovers, and LOL together as you read and they color.